The warm weather beckons — time to reacquaint yourself with the green of nature and maybe explore some of the state that you call home. That bicycle that’s hung in the garage (or the one you’ve been eyeing at the bike shop) is the perfect vehicle to really connect with a place at your own pace. So, where are the best trails to get to know NH? We asked four avid cyclists to help us narrow the choices down. Jessie Duppler, another of our experts, agrees. “You can go along the coast and have a flat ride, you can go inland and have mountains, or you can go inland and have farmland. Any kind of riding you want to do is possible,” she says. These seasoned cyclists joined up with two others to create what they call a “New Hampshire biking bucket list” so the rest of us can start checking it off. They are well-credentialed for the task: Matthes is founder and president of Seacoast VeloKids, a Portsmouth-based nonprofit dedicated to introducing young people to cycling; Duppler is a competitive cyclocross racer and bike fit expert for the Colonial Bicycle Company; Pete Shipulski has been riding in New Hampshire for 20 years and Peter Mead is general manager at Colonial Bicycle Company in Portsmouth. Our experts want you to love bicycling the way that they do, and they know that the best way to fall in love with this sport is to experience its power to connect people with places. The three places they’ve chosen as starting points are each iconic in their way: a ride up our precious and historic seacoast, the high road through the North Country and a rugged path through the wooded heartland. As any explorer knows, one trail tends to lead to another, so we’ve added a suggestion of our own — a mosey along the covered bridges in the Monadnock Region — to help a new rider branch out. If you’ve never biked beyond your neighborhood, then you first need to know what kind of bike is best for the rides you want to do. For road biking, our experts say, you want a bike with thinner tires, which are better on pavement, and a lighter weight, which makes it speedier. Commuter bikes are similar, they say, but have slightly tougher tires and features like racks for carrying things and fenders for keeping the mud off. Mountain bikes are designed for trail riding, with thicker, knobby tires and a sturdier build to handle off-road terrain. Lastly, there’s the recreational bike, which is usually the heaviest, with wider tires. These bikes are made to cruise and can handle riding on either paved roads or packed dirt and sand. They all recommend buying a bike from a local shop. Yes, they say, you might pay more, but the bike will last longer than most big-box brands because it’s professionally assembled by a mechanic who you can go back to if you have a question or problem. Besides, they add, buy local. OK, you’ve got your bike and your motivation. Next, our experts say, find a bike buddy, someone who rides regularly and is willing to show you the ropes. Arrange for meet-ups — you’re more likely to stick with it if someone is waiting for you to show up. Ditto for group rides, which are a great way to learn from more experienced cyclists and, of course, to meet people. If you worry that your fellow riders will zip away from you, sign up for the slower-paced ones with a destination like a pancake breakfast or coffee shop. Check in with bike advocacy organizations like the Granite State Wheelmen, NEMBA and the NH Cycling Club to find out what’s planned. You also might enjoy Bike the Whites (bikethewhites.com), an inn-to-inn bicycling tour that combines three days of scenic rides through the White Mountains (20 to 50 miles per day) with a stay each night at one of New Hampshire’s finest inns. Another inn-to-inn option is a tour provided by Bike the Northern Rail Trail through the Lakes and Dartmouth-Lake Sunapee regions. In recent years, many of the state’s unused railroad corridors have been converted to paved trails. Rail trails, as they’re known, are perfect for bikers looking for a woodsy ride without the hazards of rocks and roots. Another advantage — long, flat stretches that are less demanding than many in NH. 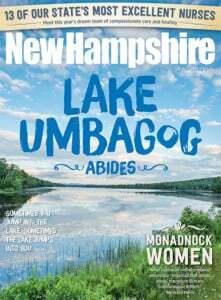 One rail-trail ride — the WOW Trail — takes you past three lakes: Winnisquam, Opechee and Winnipesaukee (thus the acronym WOW). Despite all the opportunities for biking in New Hampshire, the state has a poor ranking for being bike-friendly. The League of American Bicyclists ranks the state 27th in the country, 10th in the East. Only three cities — Portsmouth, Keene and Concord — have met the League’s criteria for being deemed bike-friendly. The criteria the League uses for the ranking: Creating safe and convenient places to ride and park, giving people of all ages and abilities the skills and confidence to road, creating a strong bike culture that welcomes and celebrates bicycling, ensuring safe roads for all users and planning for bicycling as a safe and viable transportation option. Hanover and Lebanon applied for League recognition last fall. Our experts say there are lots of great apps for bikers, many of them free. The My City Bikes New Hampshire app — free for Apple and Android — is the official guide to beginner biking in the state. Because it’s easy to get overwhelmed with maps and stats when you’re just starting out, the app breaks down biking to the basics, with everything a beginner needs to know. The app can be downloaded at mycitybikes.org/new-hampshire. Wearing a helmet is an obvious must. Other less-obvious cautions for road riding are to use hand signals and watch for opening doors on parked cars; for off-road riding, carry ID if you ride alone and have supplies like fresh water, a flashlight and a repair kit. For more information about safety, visit nhstateparks.org. So, you’re set. Ready to hit the road (or trail). Enjoy one of spring’s very best experiences. An elite cyclocross rider living in Portsmouth, Jessie likes training on the seacoast. When not on her bike, she works as a surgical technologist. Rich is founder and president of Seacoast VeloKIds. He’s also a coach for the local high school cycling team and loves to ride with his family and friends. Peter enjoys riding mountain bikes and racing cyclocross. He’s general manager of Colonial Bicycle Company and board member of Seacoast VeloKids. Pete’s been riding mountain bikes since 1988 and explored all over New England, but he enjoys NH riding the most because of the diverse terrain. This challenging ride along the Kancamagus Pass in the White Mountains is not for the faint of heart, but your efforts will be rewarded with peaceful solitude and breathtaking scenery. RICH: We have the highest summit in the East, which is Mount Washington. You can’t bike on Mt. Washington except for two days a year, and they’re both races, but the surrounding mountains are pretty unbelievable. The roads that go through the White Mountain National Forest are some of the best all-around climbing on the Eastern Seaboard. PETER: It’s an incredible ride on the Kancamagus Highway. Pretty epic, both scenery and challenge-wise because it’s really hilly. That’s probably the biggest highway in New Hampshire when it comes to road riding. JESSIE: The Three Notch Century is really popular. It’s an organized 100-mile bike ride through this region. Bear Brook State Park offers 40 miles of trail in the expansive 10,000-acre park. Bear Brook is heavily forested and the trail system is shared by bikers, equestrians and hikers. Maintenance provided by riding groups keeps the trails in good shape. PETE: I’ve done some rides out in Bear Brook in wintertime. You can ride on the frozen ponds with studded tires and explore the islands within the ponds. You get a feeling that you’re one of the first people to ride a bike out on these islands. It kind of takes you into a different world. In Bear Brook, just because of the size of it, you get the feeling that you’re really away from civilization in a lot of places. PETER: It has a ton of trails and it’s a little bit better marked than some other systems in the area. It is a little more user-friendly, but still a really challenging trail system. RICH: Because our woods are so dense and our foliage is so dense you can’t see as far. I’ve ridden in Moab and Tucson and Oregon, I’ve ridden in a lot of places, and it always amazes me how far you can see in those places because everything is so wide open. You can see forever and you can see the long trail in front of you. In New England you can only see the next 10 feet so it’s a very different feeling of riding. It’s very immersive because you’re 100 percent in the section of trail that you’re in. This road biking opportunity — from flat to hilly with almost-constant ocean views — can be enjoyed during any season, but watch for beach-goer traffic in the summer. The wide shoulder provides a buffer for cyclists. PETER: There’s a lot of competitive, higher-level road cyclists in the Portsmouth area and a lot of them will ride the seacoast. It’s not challenging because it’s really flat, but it’s a great place to ride because you get to ride right next to the ocean. It’s really beautiful. JESSIE: There’s nothing like riding along the ocean, especially if it’s right around dawn or dusk. There’s a really great shoulder for most of it too, so you’ve got a lot of room. During the summer you have to watch out for summer beach traffic as well. I think the main thing is that drivers are very courteous to you if you’re courteous to them. All you have to do is follow all the rules of the road. RICH: People come to us from Texas and Minneapolis and Chicago. When they come to Portsmouth and we take them on a ride, they’re all surprised by how challenging it is. They were expecting flat here by the ocean. And they’re always surprised by how no road ever seems to be straight. Our pick is a mostly gentle (some rolling hills) ride that takes you to four icons of long-ago New Hampshire — covered bridges. They’re all located in Swanzey, a small town just south of Keene. The first, the Swanzey-Carlton Bridge (shown here), crosses the Ashuelot River. The bridge, constructed in 1789 and rebuilt twice since, is listed on the National Register of Historic Places. Next is the Swanzey-Slate Bridge, a wooden bridge that replaced the original 1862 bridge after it was destroyed by fire in 1993. The third is the historic West Swanzey Covered Bridge (also known as the Thompson Bridge), which carries the village’s Main Street over the Ashuelot River. Built in 1932, it’s listed on the National Register of Historic Places. So is the next bridge, the 1859 Swanzey-Sawyers Crossing Bridge (also known as the Cresson Bridge). Enjoy. Goodale’s Bike Shop – With three locations in Nashua, Hooksett and Concord, Goodale’s has everything you need from bike rentals, servicing, spin classes and more. Learn more at their website. Papa Wheelies Bicycle Shop – Rent your bike online with their easy-to-use website. Located at 653 Islington St. in Portsmouth. Go to the website for details. Colonial Bicycle Company – With locations in Portsmouth and Salem, this bike shop has a dedicated stock of mountain bikes in addition to some hybrid and road bikes available for rental. Look at the list online. Red Jersey Cyclery – Located at 2749 White Mountain Hwy. in North Conway, Red Jersey Cyclery is a great spot for bike rentals, sales, repairs, gear and maintenance. Visit the website for more information. Ocean Cycles Bicycle and Sporting Goods – Ocean Cycles in Hampton Falls brings you another reliable option to rent bikes. Located at 76 Lafayette Rd. For more information, visit them online. Cannon Mountain – You’ll find a full range of Scott and Giant all-terrain bikes for adults of all ages with direct access to the Franconia Notch Bike Path. Full-day bike rental is $40 while a half-day is $25. Visit them online to learn more. Waterville Valley Adventure Center – Rentals and daily trail passes are available at the Waterville Valley Adventure Center. And with access to more than 30 miles of marked and well-maintained dirt and road trails, you can put those rental bikes to good use. Visit the website for more details. NH Bureau of Trails – Track down scenic places to go biking in New Hampshire with this extensive list of trails. NH Department of Transportation – No matter what region you are looking to bike in, NHDOT has you covered. Visit the website to find the perfect trail for you. Rails-to-Trails Conservancy – Discover dozens of New Hampshire trails and find comprehensive trail guides, trail maps, along with descriptions, photos and reviews. Go to traillink.com to scroll through the list yourself. New England Mountain Bike Association (NEMBA) – Find dozens of trail suggestions for New Hampshire and all of New England with NEMBA. Visit their user-friendly website for more details. Bike-Walk Alliance of New Hampshire – The Bike-Walk Alliance of New Hampshire educates and advocates to improve walking and bicycling conditions statewide. You can find trail information through the website. Granite State Wheelmen – With starting locations widespread throughout the Granite State, Granite State Wheelmen brings groups together for bike rides, including on-road and easy off-road rides, orientation and training rides and more. New Hampshire Cycling Club – Based in the central part of the Granite State, the NHCC promotes several annual events that bring bikers together, including the White Park Cyclocross and the New Hampshire Motor Speedway Thursday Night Training Series. Lakes Region Bicycling – Lakes Region Bicycling organizes group rides for mountain and road biking. The organization also acts as an advocate for improving conditions for bicycle riders throughout the region. Seacoast Area Bicycle Riders (SABR) – Since 1992, SABR has gathered bikers of all levels together to promote safe and effective bicycle transportation networks on the Seacoast. Your local bike shop – Many bike shops organize group rides. Check in with one near you to see what's offered.